The Cumberland Country Club (CCC) was established in 1919. The first woman to win the Women's Club Championship was Bess Shearer in 1922. 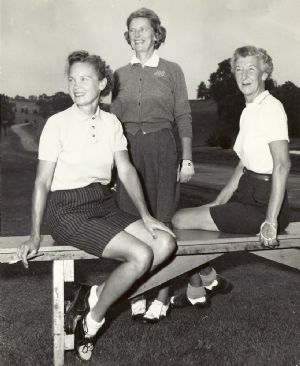 For the next five decades, with the exception of 1943-1947 when no tournaments were held, the above three women were felt to have dominated the golfing scene at the Cumberland Country Club, as well as throughout the area. As noted below, and in addition to golf, they also made their presence known in skiing and tennis. Betty Hodges won a total of nine CCC Golf Championships (1938, 1941, 1942, 1948, 1955, 1958, 1967, 1969, and 1972), as well as the Old Herman (German) Trophy in 1969. She also scored a hole-in-one in 1960. It is of great interest to note that Betty Hodges and her husband, Dr. Royce Hodges, were among the leaders of the Western Maryland Ski Club. In 1938 they, along with several other ski clubs in the Baltimore and Washington area began a letter writing campaign directed to the Maryland Forestry Department. The purpose was to have a ski resort area established in Maryland. They were successful, and in January 1940 the ski resort opened, with the first actual ski event south of the Mason-Dixon Line being held in February 1941. Referred to as the "Maryland Alps" during the 1940s and 1950s, the location was in present-day New Germany State Park and Savage River State Forest. Evelyn Bowie was also a local champion golfer, and in July 1968 won the S.T. Little (Jewelry Store) Trophy for low net score at the CCC Invitational Tournament. She is remembered as scoring two holes-in-one, at the CCC in 1951 and again in 1958. Bowie won four club championships, these being in 1949, 1950, 1954, and 1956. In addition to golf Evelyn Bowie also excelled in tennis and along with her husband not only dominated the Allegany County Mixed Double Tournaments having won ten championships during the 1940s and 1950s, but also ruled the tennis courts at the CCC where they reigned as mixed double champions year after year. On the civic front, Evelyn Bowie is also identified as having served on the Allegany County Welfare Board in 1956. Evelyn Bowie and Jean Arendes Bibby were golfing partners and buddies over a span of many years.